In this thread you will find selections, past performances and information. 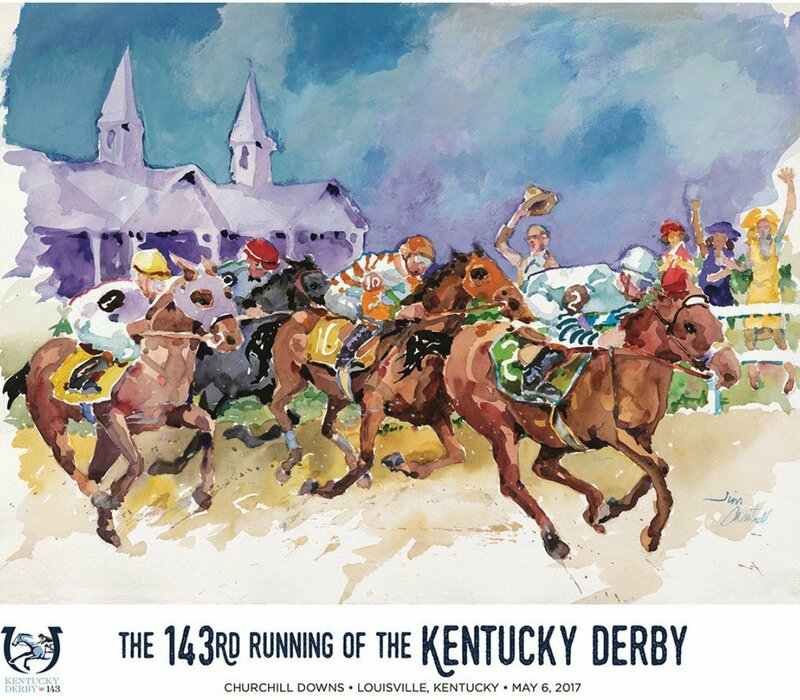 Good Luck with this years edition of the KY Derby !! Feel free to post your picks as well. Simply click the link to download the Past Performances. to make an impact in the stretch drive. main track, all as a 2-year old. odds-on favorite and stamping himself as one of the early favorites for the 2017 Kentucky Derby. picked up where he left off, stretching his undefeated record to a perfect 4-4 with the Tampa Bay Derby his next stop. was 3 lengths clear of McCraken. generous price in the Kentucky Derby. There are several sound reasons to just 'draw a line' through his Blue Grass performance. to gallop out strong past the wire. stone' to the first Saturday in May. out his affinity for this 'quirky' racing surface. out from 6 furlongs to 7f. stretch when Irish War Cry spurted well clear of his 6 rivals on his way to an easy 3 3/4 length victory. front runner. He had no response and instead lost ground with every stride to finish a 'head scratching' 7th, beaten 21 3/4 lengths. of his stubborn foe inside the 1/8th pole, edging clear to win by 3 1/2 lengths. War Cry can once again bring his 'A' game to Churchill the first Saturday in May, I would consider him one of my win candidates. a price, but if he is to win like Mind that Bird, he will also do it from well off the pace. and third place finish, which were both 'better than they look on paper', especially his narrow defeat November 13 at Churchill. to edge clear in the shadow of the wire. finish with a strong gallop out past the wire. is clearly a danger to win the Derby at generous odds. he could return to a regular work pattern in preparation for the Arkansas Derby. benefited by a contested lively pace and a picture-perfect ride. Classic Empire is the type of horse I will be playing against to win the Kentucky Derby. The negatives outweigh the positives. His setbacks this year and the short 21-day turnaround between the Arkansas and Kentucky Derbies is too quick for my liking. Classic Empire needs too much to go his way and that will be difficult in a 20-horse field with 160,000 + spectators in attendance. 1-2 odds and in his second start in a Grade 2 stake at 6 furlongs on a dry track. stable twice had likely Derby favorites, Uncle Mo in 2011 and Eskendereya in 2010, who were sidelined just before the race. Uncle Mo came down with an illness and Eskendereya suffered an injury. the catalyst for the strong wagering action expected on him. He trounced a weak field in his maiden win at 1-5 odds at Tampa Bay Downs off a 5-month layoff in his first start as a 3-year old. was set for a career best performance making his third start off a layoff. Velazquez. He cruised up to take the lead without much urging at the top of the stretch and drew off to an easy 5 length victory. stride and his physical built implies more of a middle-distance runner than one that will excel at 1 1/4 miles. intriguing horses with merits who could 'key' a more generous payoff. for his chances on Derby day going 1 1/4 miles. races. At best, I will use J Boys Echo very small in some saver wagers only because I expect him to be in the vicinity of 30-1. Trainer Keith Desormeaux will once again team up with his brother Kent, who will be aboard the quickly improving Sonneteer. tables on that rival winning the Preakness 2 weeks later. able to move forward once again on the stretch out to 1 1/4 miles. his 10 starts winning the Kentucky Derby. when third to that same rival in the Arkansas Derby. piece in the Kentucky Derby. If the fractions are quick enough and he can avoid traffic problems. There is no disputing that Gunnevera is one of the most brilliant yearling purchases that the 'Wizard' can recall in recent years. He was bought for $16,000 at the 2015 Keeneland fall sale, just $1000 more than the stud fee of his sire Dialed In. in a career best performance. The Florida Derby would go a long way in determining where Gunnevera was in the pecking order for Kentucky Derby contenders. a 'no threat third', beaten 6 1/2 lengths. simply not accomplished enough or run fast enough. but was unable to hold off the late charge of Gormley, in race where several 3-year olds were bunched up at the finish. the first Saturday in May. and, in the end, lose the war. stretch, he edged clear from Battle of Midway and Royal Mo, who did all the dirty work up front to help set up his closing run. and no rider is stronger than a horse whose mind is on being part of a quick early pace. running his last 1/8th of a mile in a slow :13 3/5 seconds. especially in the stretch drive as the 2-1 second choice. Tapwrit had shown steady improvement in winning 3 of his prior 4 starts, capped off with a decisive win in the Tampa Bay Derby. perfect inside trip and was no match in the stages of the race. Tapwrit is one of the 3 horses Todd Pletcher will be running in the Derby. He's a typical Pletcher high priced yearling purchase. winner both from a quality standpoint and his ability to be able to handle the 1 1/4 miles successfully in a field of 20.
distances than at 1 1/4 miles. In 6 career starts, he has shown this to be a true statement. pair of seconds in both the Fountain of Youth and Blue Grass. Practical Joke made several moves chasing Irap, and was gaining slowly on the winner in deep stretch to miss by 3/4 of a length. He was well clear of the 2 betting favorites McCraken and Tapwrit. not feel it will be Practical Joke who will provide Brown his first one. even making the Kentucky Derby prior to the Blue Grass, or even predict he would win the race, was just a 'pipe dream'. Grass victory, which will likely result in an 'off the board' finish. Invades US soil for the first time from Dubai for the world class Goldolphin Racing operation and is trained by Saeed Bin Suroor. Derby. History is clearly not on Thunder Snow's side. sire and dam side for class, speed and stamina but his inside post draw does not do him any favors. his upward progression, capped off by a victory in the Grade 2 Louisiana Derby. that was called off on April 25. These are major negatives that should not be overlooked. and for that reason State of Honor is a complete throw-out for me. going to win in the last 1/8th of a mile, but instead flattened out when it counted. be pointing for easier spots at middle distances. A 1-turn mile hit's Untrapped right between the eyes, not 1 1/4 miles on Saturday. 3 career starts. Patch made his debut January 15 sprinting at Gulfstream finishing well from far back to just get up for second. out to a 1-turn mile. Patch showed improved speed, wearing down his pace rival late and edging clear to a hard-fought victory. turns for the first time, the son of Union Rags ran well in defeat to finish second behind leading Kentucky Derby point earner Girvin. year olds later down the road, but on Saturday he will have to settle for an 'off the board' finish. at the back of the pack. Some of the bloodlines that are part of the current field can be traced back to horses that have solid wet track influences can be traced to sires such as Curlin, Malibu Moon and A.P. Indy. The horses that are part of said bloodlines include Irish War Cry, Gormley, Hence and Patch. Sonneteer's sire Midnight Lute won a Breeders' Cup Sprint championship in the slop at Monmouth Park in 2007. Irish War Cry’s sire Curlin, won the Breeders' Cup Classic at a mile-and-a-quarter that same year in the slop by open lengths. Gormley’s sire Malibu Moon produced 2015 winner Orb. Of the horses in the field, six horses have wins on an off-track: Classic Empire (maiden at 4.5F), Gormley (G3 Sham), Tapwrit ($75K stake), Hence(maiden at 8.5F), Battle of Midway (wet fast, maiden at 6F), and Royal Mo(good, maiden at 1m). Three horses have placed on off-tracks, Untrapped, Lookin at Lee and Sonneteer. Only Gormley accomplished the feat in a stakes race and Hence and Gormley at a distance greater than a mile. Most of the 3-year-olds will be running 1 1/4 miles for the first time on Saturday. Besides the distance, the traffic-choked conditions typically eliminate half the field in the opening quarter-mile. Appears to be coming into his own after impressive five-length win in Florida Derby. Always Dreaming has the potential to be the first Derby favorite for trainer Todd Pletcher, who will have two other starters in the race. The dark bay colt prefers to run at the lead or close to it. His sire Bodemeister finished second in the 2012 Derby. He has three wins in five career starts and earnings of $648,900. Pletcher and jockey John Velazquez have one Derby win apiece. The main knock against the colt is that his two wins as a 3-year-old have come against lesser competition. The colt won last year's Breeders' Cup Juvenile on his way to earning 2-year-old male champion honors. Then again, only three other colts have won year-end honors since 2000 and gone on to win the Derby the following season. Classic Empire has the highest earnings of $2.1 million among the horses expected to make the field, with five wins in seven career starts. He's coming off a win in the Arkansas Derby. Trainer Mark Casse has never won the Derby and neither has jockey Julien Leparoux. His sire Pioneerof the Nile was second in the 2009 Derby and he also sired 2015 Triple Crown champion American Pharoah. The colt topped the Derby leaderboard with 152 points earned in prep races. But the Louisiana Derby winner has a crack in his right front hoof that has compromised his training in the last week. Trainer Joe Sharp has used a special shoe, a hyperbaric chamber and therapeutic waters to get Girvin in shape to run on Saturday. Sharp is married to retired jockey Rosie Napravnik, who exercises the colt and is her husband's assistant. Girvin has won three of four starts, with his only loss on turf. His jockey is Hall of Famer Mike Smith, who has a reputation for winning big-money races. Smith has never ridden Girvin, but he picked up the mount after Mastery, his top Derby contender, got hurt. The chestnut colt is a closer ready to pounce if he gets set up by a strong early pace. His earnings of $1.1 million are second-most on the Derby leaderboard. This is the first Derby starter for trainer Antonio Sano, who survived two kidnappings in his native Venezuela before moving to Miami. Jockey Javier Castellano, also from Venezuela, was just elected to racing's Hall of Fame and in search of his first Derby win. His best finish was fourth in 2013. The colt has four wins in nine career starts and finished third in the Florida Derby. His sire, Dialed In, won the 2011 Florida Derby and finished eighth in the Kentucky Derby. Had solid victories in Holy Bull and Wood Memorial, making it seem like the Fountain of Youth was an off day for him. The colt is a son of two-time Horse of the Year Curlin, who finished third in the 2007 Derby. Has four wins in five career starts. The chestnut colt likes to press the pace. No New Jersey-bred horse has won the Derby since Cavalcade in 1934, and none has run in the race since Dance Floor took third in 1992. Owner Isabelle de Tomaso, who is in her 80s, is the daughter of Amory Haskell, for whom the Haskell Invitational at Monmouth Park is named. Tomaso was a race car driver in the 1950s. Trainer Graham Motion won the Derby with Animal Kingdom in 2011; jockey Rajiv Maragh has never won it. GREAT Info! Thank you my friend!!! Can't wait for the Durby!! 1. Lookin at Lee, 20-1 Ran 3rd in Ark Derby. Has run in good company but doesn't seem to win at this level. Will fall back early and then try to come from the clouds. Hence the 1 post won't really hurt him. With a lifetime best speed fig of 94 he just doesn't seem fast enough. The added distance should help him though.As a 2 yo ran a nice race at CD. Will pass some horses in the stretch. 2. Thunder Snow 20-1 Has some talent. Shipping in from Dubai where he won the UAE Derby. Historically the winner there doesn't do much in Kentucky. Has a tracking style. Never run in the US. Not sure about the surface and distance here. 3. Fast and Accurate 50-1 Did not run in a major prep race. From a class standpoint, seems a level or 2 below the best here. Has been winning at that lower level but can he move up here? Should show early speed. On or near the lead early. No races at CD but a couple of solid works there so it looks like he is taking to the track. Biggest problem is his speed figures. Has yet to crack 90 which won't get it done here. May get used up on the front end. 4. Untrapped 30-1 Finished up the track in the Ark Derby. Appeared to tire.Likes a stalking trip. Ran a nice race in The Risen Star. Has regressed since then. Won a race here at 2. 5. Always Dreaming 5-1 A deserving favorite. Has done very little wrong. Would like to have seen run another race at 3. A little green. Ran a great Fla Derby with a 102 speed fig. Soft early fractions seemed to set that race up well for him. Good connections. Has never raced at CD so we'll see how he handles the strip. Should sit just behind the leaders which should be a good place to be. Good breeding so I don't think the distance is a problem. 6. State of Honor 30-1 Ran 2nd in Fla Derby. Like to be on or near the lead. Was in good position in Fla. No excuses there. Never ran at CD. The one work I see there not all that impressive. Not sure he is going to like the added distance. Improving speed figs is a plus. 7. Girvin 15-1 Nice horse but another one who is a little green. Won the Risen Star and the LA Derby. Improving speed figures. Likes a stalking trip. Should sit off the pace and make his move at top of the stretch. Has the look of a horse that should like the added distance. Not sure of the quality of animal he beat in those 2 races. If he improves off his LA Derby, it should put him in the mix. One good work at CD. 8. Hence 15-1 Comes off a win in the Sunland Derby. Not historically the strongest of prep races. Took advantage of quick early fractions there. Was given a speed fig of 103. Not sure Im buying into that based on his previous races.Will probably drop back early and save his move for the stretch.Did get 2nd in a race at 2yo at CD. Maybe a bit outclassed here. 9. Irap, 20-1 Won the BG Stakes. Benefited from very slow fractions to win on the lead. 100 speed figure there, but doesn't rate to get a trip like that here. Should be on or near the lead early. Got beat by Hence in the Sunland. No races or works at CD. 10. Gunnevera, 15-1 This is one that stood out for me at first glance. Got 3rd in Fla Derby. Rough trip there. Won the FOY with a 102 fig. Come from pretty far off the pace and would appear to like the added distance. No races or works at CD. 11. Battle of Midway, 30-1 Got 2nd in the SA Derby. Was caught in the stretch after being on the lead the whole race. A green horse who seems to be improving. No races at 2yo. Like to be on or near the lead. May wind up out front here. No races or works at CD. Speed figs going in the right direction. Not sure about this distance for him. 12. Sonneteer, 50-1 4th in the Ark Derby. Seems to be a cut below the best here in class. Improving speed figs but would need quite a jump to compete here. Lots of 2nds and 3rds, but doesn't win. Will lay off the pace. No races or works at CD., Has the look of a plodder. 13. J Boys Echo, 20-1 4th in the BG, won the Gotham. Ran a 104 in the later, but looks a little suspect. Somewhere between tactical speed and a closer. Slow fractions in BG compromised any shot he had there. His first race was at CD. Seemed to like the track. Recent work there so so. 14. Classic Empire, 4-1 Im thinking will be the 2nd favorite here. Won the Ark Derby with a 96 speed fig. Won the BC Juv with a 108. Very impressive race. Likes a stalking trip but can come from further back. Versatility is a nice trait in this race. Has won a CD. Seems to be coming into his best form. Will be a factor on Saturday. 15. McCraken, 5-1 Another one of the favorites.3rd in the BG with a 96 speed fig. May have been a race short for that one. Also likes a stalking trip. Runs well at CD. Also should be a factor. 16. Tapwrit, 20-1 5th in BG, won TB Derby, Ran a 101 in TB. Likes to run just off the pace. Also fairly green. Got beat by McCracken 3 back. No races or works at CD. Had an excuse in the BG. Maybe with added distance he can turn tables on McCraken? 17. Irish War Cry, 6-1 Got 1st in The Wood. Speed horse who should be near the front here. Not the post he wanted. May have to work early to get into position. Tired in FOY so not sure about the distance. His top speed figures puts him in the mix here. No races or works at CD. 18. Gormley, 15-1 Won the SA Derby with a 99. Ran a 102 in the Sham. Like to run just off the lead. Tired in the San Felipe but was coming off a layoff. No races or works at CD. Good connections. May have to gun it out of gate to get any sort of position. 19. Practical Joke, 20-1 Got 2nd in BG with a 99 speed fig. Probably a better race than it appears because of the slow fractions. Likes to come off the pace. Expect him to drop back off the start and try to save ground. was a monster at 2, still trying to get back to that form. Got beat by Gunnevera in FOY. No races or works at CD. Seems to be moving in the right direction. 20. Patch, 30-1 2nd in LA Derby with a 98. Ran a 101 when he broke his maiden. With only 3 races under his belt [unraced at 2] they might be asking too much of him here. Likes at stalking trip which might not be possible with this post. They may have to take him back early. No CD races or works. DRF Kentucky Derby Formulator Past Performances. Give it a moment to upload, there is a lot of great information here. Click on almost every race to see the Past Performance from that particular race. This stone-cold closer will drop back from the inside and pass as many as he can late. He was beaten just a length and a half in Arkansas by Classic Empire. The added ground will help, but from Post 1, about the best he can hope for is a third- or fourth-place finish. And even that might be wishful thinking, as just four horses have finished in the top five after breaking from the rail since Ferdinand won from Post 1 in 1986. The lack of Derby success for runners that prepped in Dubai is well-noted. Of the 11 that went from Dubai to the Derby, the best finish is fifth by Master of Hounds in 2011. No UAE Derby winner has been better than sixth in the Derby. What happens at the break with Thunder Snow is anyone's guess, but if he wins from Post 2, I lose. Supplemented into the race as a vanity entry after a shocking win in the Spiral at 25-1, he'll likely be a brief pace factor and that's it. No shot. Blinkers will come off for a horse that hasn't really shown much interest in finishing the last few races, suggesting the distance of 1¼ is out of his scope. Maybe the blinks off will relax him some, but its not like he's been on the pace with them. Untrapped looks like one that will just go around the track for a midpack finish. Note that he did break maiden for fun in a 12-horse field at Churchill Downs last November, so if you want to use him third or fourth, that wouldn't be the worst idea if you have a few extra bucks to cover him. One of five in the field that was winless as a 2-year-old and will try to become the first since Monarchos to win the Derby after going winless at 2. With this post draw, I don't see any way he isn't on the lead and given how headstrong he's been in the morning, I can't see him lasting 1¼ on the front end with pressure throughout. Todd Pletcher's 1-45 mark in the Derby is well-known, but if you drill down and find Pletcher/John Velazquez entries that were among the top five betting choices -- Carpe Diem in 2015, Intense Holiday in 2014, Verrazano in 2013, Devil May Care in 2010 and Bandini in 2005 -- none finished better than 10th. This isn't Belmont, Gulfstream or Saratoga. Don't get sucked into well-known connections that haven't fared well here and whom the pace scenario doesn't likely favor. I'll pass. See you in the King's Bishop. One of the most experienced horses in the field, State of Honor has only a maiden win on the synthetic sprinting at Woodbine. He looks to be one who will press Always Dreaming to ensure a fast pace -- which would help Mark Casse's other horse, the favorite Classic Empire. I can't see State of Honor hitting the board. Girvin has been battling foot problems and I'm not sure how good the fields he beat at Fair Grounds were. He has the right running style but it's highly doubtful he will get a clean, easy trip as he has in New Orleans. In Mike Smith's 55th career Triple Crown mount (third all-time), you know he'll give Girvin the best chance to win, but there are too many questions about the fitness of the horse for me to get excited about him having a legit chance to win. Hence was the winner of what has apparently become a key prep. His running style appears to fit what a Derby winner would look like, and he showed speed in a maiden race at Churchill Downs last year so it's not like he's a plodding closer. He has worked great leading up to the race and his bandwagon is getting full of supporters, so he will likely be closer to 10-1 than 15-1 come Saturday. Those who aren't fans will point to the lengthy gap between races, and view him as a one-race wonder. I think he fits, but also remember Steve Asmussen is 0-13 in the Derby with just two in-the-money finishes. But, to me, all indications point to a solid effort Saturday. I'll be using Hence in all spots in the trifecta, as he is on the short list of contenders. The long-shot winner of the Blue Grass as a maiden was soundly beaten by Hence in New Mexico, and may have caught a speed bias that day at Keeneland. My guess is he's just a merry-go-round type here who doesn't contest the pace, but doesn't take all the way back either. And that pegs him for a finish somewhere in the area of 11th. He would make the list of "great stories if he wins," given trainer Antonio Sano's past. Surprisingly, Javier Castellano hasn't hit the board from 10 Derby mounts, so while Castellano is a great rider, don't think his presence necessarily moves the horse up to elite status. Then again, maybe it's not too surprising Castellano hasn't posted an in-the-money finish in the Derby, given that he has hitched himself to Todd Pletcher's second string more often than not. Gunnevera ran huge in the Fountain of Youth and then regressed in the Florida Derby. He'll be coming from the clouds and be at the mercy of the pace, but he should get the distance. Be warned though, all of us racing fans know that one guy who is a "mush." Well, the one I know loves Gunnevera. I'll still use him in trifectas, but I don't think he can win. "He can't win, he was unraced at 2 [years old]!" So, if he debuted on Dec. 31, 2016, as opposed to Jan. 21, that means he can win? Sorry, if he doesn't win or doesn't fire it has nothing to do with being unraced at 2. It means he just wasn't good enough or fast enough, and that the speed figures were indeed spot-on. Despite the sentiments above, I will be using Battle of Midway prominently. He broke maiden at first asking, then went right into stakes company, where he predictably ran third. After that he ran a good race in an allowance, coming from off the pace and beating the ill-fated Reach the World. He found himself on the lead in a paceless race at Santa Anita, and I don't think Flavien Prat will have him there Saturday. He's among the classiest bred horses in the race and if he takes back, I think he has a very big opportunity to factor into the outcome of the race. I'm using Battle of Midway up and down the trifecta. I know he's a maiden, but if you like Classic Empire, don't you have to like Sonneteer at roughly 10 or 12 times the price? He was beaten just 2 lengths by Classic Empire in Arkansas, and now gets added ground. I'm not saying he can win, but I do think he's worth using in third and fourth as a one-run-type closer. Dale Romans horses at double-digit prices are always worth using. He's had nine horses crack the tri in Triple Crown races -- eight were at least 12-1, five were at least 15-1 and three were at least 20-1. J Boys Echo is also just one of three in the field to have cracked 100 on the Beyer scale and he has dramatically longer odds than Classic Empire or Irish War Cry. His Blue Grass was so bad I'm just throwing that race completely out (for all runners), and I expect J Boys Echo to run down as many as he can late. He ran a very good second in his debut at Churchill Downs, which is a huge plus. I don't know if he can win, but I may throw him in the win spot in some of my wider pick-fours and trifectas. And I will totally use him for second and third. The morning-line favorite hasn't had the smoothest of journeys to this point. He will likely be one of the softest favorites ever, but his success as a 2-year-old at Churchill Downs, along with his closing rush to win the Arkansas Derby, will certainly garner him many supporters. I will not be one of them. In Arkansas, he basically had to "reach the bottom" to barely get past Conquest Mo Money, who balked at the start and then cut out all the fractions. And the Beyer figure still came up only 94. Hence had a much easier time dispelling Conquest Mo Money at Sunland, and his figure was better too. The Daily Racing Form had a great number on trainer Mark Casse and his lack of success winning 3-year-old graded stakes on dirt. Jockey Julien Leparoux hasn't had the best of luck in the Derby either. He was on favorite Dialed In in 2011 and finished eighth. Then he had a brutal go of it on second choice (and eventual Belmont winner) Union Rags in 2012, finishing seventh. While I think he could hit the board, I have this nagging feeling he will regress. Will the favorite really win for a fifth straight year (which would be unprecedented)? I'll be taking an "if he wins, I lose" approach here. McCraken's morning line of 5-1 is laughably short given his poor showing in the Blue Grass and the fact he too was laid up a bit. My guess is his 3-for-3 mark at Churchill Downs and his win at Tampa had a lot more to do with that morning line, since McCraken had already secured his spot in the Derby field by the Blue Grass and trainer Ian Wilkes could have simply used the race as a true prep for the Derby. That said, who knows what was truly behind him in the Tampa Stakes race, and his earlier Churchill Downs races as well? I just never got the sense I was seeing a Derby winner when watching him run. If you like him, you're getting a terrible price -- he should be much closer to 15-1. I'm torn on what to do with him as I don't think he can win, but it wouldn't completely shock me if he does. Can I make a future wager on Tapwrit in the Belmont? Because Todd Pletcher in the Derby ... no thanks. Since 2007, Pletcher has run 31 horses in the Derby. With Calvin Borel up, he's 2-2 in the money, including his only win with Super Saver. With all other jockeys, he's 1-29 ITM. I don't see Churchill specialist Calvin Borel anywhere on the card. Tapwrit is not as bad as the Blue Grass made him out to be -- and I think he has a chance to outrun his odds with an outside stalking trip. He has looked good leading up to this weekend as well. I won't use him on top, but will use him underneath, as not using Pletcher's Revolutionary in 2013 cost me a nice exotics score (when Orb was my top pick). Irish War Cry has won at three different tracks, appears to have no distance limitations and is comfortably drawn outside. Of all the horses with single-digit odds, he is the one I'm most confident will run his race. Forget about the whole "but nobody has ever won from Post 17" theory, a line of thinking that brought you since-debunked myths like "Big Brown can't win from Post 20" in 2008 and "I'll Have Another can't win from Post 19 " in 2012. So if Irish War Cry drew Post 16 or 18, that would be the thing that seals the deal? He has shown rating ability, and has won from the front end and from well off the pace. He's the only runner with two triple-digit Beyers. The only knocks against him would be his no-show in the Fountain of Youth, and the fact the Wood Memorial hasn't been the best of preps lately. There's a whole lot to like here, including extremely easy connections to root for. His figures are light, but Gormley is 4-for-6 with multiple Grade I wins, has a jockey who has won five of the past nine Triple Crown races, and an owner-trainer combo that has already won the Derby with a huge price (Giacomo in 2005). Gormley is proven in the mud and has won from off the pace and on the lead. I think he's a huge player from the outside and for those worried about his low figures or his poor time at the Santa Anita Derby, Nyquist didn't have a great route figure last year prior to the Derby. Neither did I'll Have Another or Giacomo. Remember, Gormley was the 5-1 second choice in the BC Juvenile (Classic Empire was 9-2). He's on my short list of potential winners. He's been best in one-turn miles, and hasn't quite shown great finishing ability in the Fountain of Youth or the Blue Grass. A handicapper I respect really likes his chances here, but I can't see him winning and would also be surprised if he factored in the trifecta. Practical Joke has the right running style, but I just don't think he's good enough or wants to go this far. The public loves a good underdog story, so the one-eyed Patch will probably get bet down by the tourists. Like Tapwrit and Always Dreaming, he will probably go on and have a very productive year, as he has raced only three times and was a respectable second to Girvin in Louisiana. I would anticipate him trying to avoid getting fanned seven-wide around the first turn, and trying to pick off as many as he can late. He'll finish somewhere in the top eight or so. He was one of the top Derby contenders with an impressive three wins in four starts, and a win in the Louisiana Derby. In fact, he's a perfect 3-for-3 on dirt. But the discovery of a quarter crack in one of his feet has caused a lot of the pundits to back off. The injury certainly is one to be concerned about, but it's not an uncommon ailment in racing. The injury has been treated and trainer Joe Sharp is confident the colt will run well in the Derby. His speed figures at first glance aren't very fast, but it's hard to argue his accomplishments, including winning the two major Derby prep races in Louisiana. One advantage that Girvin has is his ability to be in the "second pack" of the race, which should put him in a prime position as the field heads around the far turn. And the fact that he is 15-1 in the morning line makes him worth pursuing. The price will definitely be right. Over the past few years, Southern California has produced many Derby winners including American Pharoah, California Chrome and Nyquist. This year, Gormley is the best horse to emerge from the West Coast and is flying under the radar. Much like Girvin, he did not put up impressive speed figures, but he managed to win two of the three prep races at Santa Anita including the last one, the Santa Anita Derby. He has won four of six starts, with the losses to Classic Empire and Mastery. It also won't be the first time that his trainer came into the Derby with a long shot. John Shirreffs brought Giacomo to Louisville in 2005 and pulled off a shocker, so he certainly knows what it takes to win this race. His post position is not optimal (1-for-30) but he has the benefit of being paired with jockey Victor Espinoza, who won the Derby three times including aboard American Pharoah. If he doesn't get floated out too far on the first turn, he could be dangerous. Plus, if the track is sloppy, that's a big plus. With a field as big as the Kentucky Derby, some years the race "falls apart" and a horse from the back of field is able to thread his way to the front and pull of the upset. This could be that horse. He burst onto the Derby scene when he ran second to Irish War Cry in the Holy Bull and in the process, beat Classic Empire. He followed that up with a last-to-first win in the Fountain of Youth, which is the kind of run he would need to be a threat in the Derby. Another big plus for the chestnut colt is he keeps jockey Javier Castellano, who has been one of the top riders in North America over the past few years. Post No. 10 is tied for the most wins in the Derby with nine. As long as he is 12-1 or better, Gunnevera is a solid play. He nearly beat Gormley in the Santa Anita Derby, and with the huge price this colt will bring on Derby Day, he's worth a look. The colt is starting to come into his own and the fact that Hall of Fame trainer Jerry Hollendorfer has brought him from Southern California is an indication that he thinks the colt has a chance. The son of Smart Strike has won two of four, with his best race a few weeks ago in the narrow loss at Santa Anita. The key for him is not getting into a speed duel. His price needs to be long to be worth a play. Notes: Is HE the “wiseguy” horse this year? Was on the outside looking in until last weekend and my phone blew up with texts and tweets. If all of those people bet on him he might be 10-1. He’s never won a race around two turns in six tries, which is hard to believe since he’s always gaining ground and weaving through fields in the stretch. The distance should help him but he comes from the moon. And it’s so hard for those horses to get the right trip in here unless things completely fall apart. I’ve been saying for three months that this is the year a horse like him picks up the pieces and pays $65 to win but after looking at the race I feel it’s going to be super tough for him to get his picture taken. I will use him in all of my exotics and maybe on a saver multi-race wager for my sanity’s sake. Notes: Like most of the “Derby Rules,” a horse will in all likelihood travel over from the desert one day to win America’s greatest horse racing prize. I doubt it’ll be one that arrives less than a week before the race, doesn’t train until the Tuesday before and was being considered for two other races in Europe before they finally made the decision to come here. He looked great going a mile, less so going 9.5 furlongs last out. Plus, this seemed like a weak bunch over there this season. Not for me. Notes: He’s won his last three since the addition of Lasix but they’ve came over the synthetic surface at Turfway and on turf. His win in the Spiral last out was completed with a final three furlongs in over 40 seconds. He was abysmal in his lone start on conventional dirt at Parx. I believe we’ve found the winner……for the worst case of Derby Fever this season. Toss. Notes: Eligible for an entry level allowance contest, he tried his hand at both the Fair Grounds and at Oaklawn this winter and though he got a piece of the pie on three occasions he’s yet to grab the brass ring in a big one. Maiden win was over the course. His sire was best at middle distances and he’s lost ground in the stretch in his last three starts. Toss for me. Notes: You knew this guy was special when Johnny V. took a Wednesday off from riding at Gulfstream Park to go break his maiden at Tampa Bay Downs. That was back in January in his first start for Pletcher and around two turns. He’s perfect in all three tries for his new barn, including two at nine furlongs, something no other horse in the race can say they did. His Florida Derby was eye-catching….he sat just off the early and galloped home by five. But he was aided by a speed-biased course and his trainer owns Gulfstream. Since his arrival at Churchill he’s been very amped up in the morning, so much so that they had to change some equipment and the way they train him. You don’t want your hose to be dull but you don’t want a raving lunatic either. And it is tough to look past his trainer’s record in the race. I’ll use him underneath in my exotics. Notes: He’s eligible for an entry level allowance contest. He’s lost ground in the stretch in his last four starts. He’s winless on conventional dirt. His pedigree screams “middle distance.” He figures to be a major part of the early pace despite the fact that he came from just off of it when he was second in the Florida Derby. I can’t see him playing any better in the outcome. Notes: Of all the Derby contenders, his stock has dropped the most in the last month and he hasn’t even raced. Over the years, I’ve grown more and more suspicious of the Fair Grounds form and this might have been the most suspect bunch down in the bayou in recent memory, so I wasn’t a fan to begin with. Then his trainer piped up, avoided most reporters and it was unearthed that this colt was training with Z bar shoes. Sharp has said he’ll race in conventional shoes but his foot/feet is/are likely in shambles. Hernandez opted to stick with McCracken, which isn’t a great sign, even if you think there were some politics involved in the decision but you do get one of the best in the game on his back. I just don’t know how you can have any confidence that this horse is close to 100% and believe you me that’s what he’d need to be to have any chance in here under optimal conditions. Toss. Notes: The love affair some have with this guy boggles my mind. He’s run some average races in his career. I’m always skeptical when a horse breaks his maiden on a wet track, like he did. And he couldn’t have gotten a better setup then he did in his Sunland Derby win when they flew on the front end and he beat second-stingers, at best. That race came back significantly faster than any other he’s been a part of that it’s hard for me to believe it. He has the feel of a “wiseguy” horse and I think he’s going to take a lot of money. I want no part of him. Notes: It took him eight starts to break his maiden, then he did so in grand fashion taking the Blue Grass. He was aided by a speed favoring racetrack, a slow pace and likely by the fact that he was being chased after by a horse that likely has distance limitations. Oh, he was on his wrong lead, too. He does have strong connections in his corner as these guys have teamed up two of the last five runnings of the race. But I’ll Have Another was lightly raced and Nyquist was a juvenile champion. This horse was in the right place at the right time last out. I don’t believe that to be the case in here. Plus he’ll probably take some action. Not for me. Notes: Every year, we hear how so many in the Derby want no part of the added distance and how one or two are going to relish the ground. It certainly looks like this guy falls into the second category. He’s won at Gulfstream, Saratoga and on a “bullring” at Delta Downs, three places that historically favor front runners. While he is a bit pace dependent I feel the extra furlong negates that a bit. The obvious blip is that deep closers have so much trouble winning this race because of the bulky field and the traffic usually associated with it. He does have the winner of the last four Eclipse Awards for Outstanding Jockey on his back and he’s one of the few in here whose pedigree leads you to believe the 10 furlongs is ideal. I don’t see a lot NOT to like and he’ll be running through the lane while others will appear to be in quicksand. A win contender. I’m using him in most of my multi-race wagers and all my exotic plays. Notes: Another lightly raced, Apollo Curse candidate, he was ultra-game in the Santa Anita Derby when second. He was part of a quick pace and was the only one the lived to tell the tale in deep stretch. My problem with him is that I feel like he’ll bounce off that effort, which to me was easily his best to date, and it’s so hard to win this on the lead. I wouldn’t be surprised if he turned into a player in the division later on this summer but I’m not a fan in here. Notes: He’s looking to become the first maiden over 80 years to win the roses in his eleventh start. Deep closer type tried the Arkansas route to Louisville. I wouldn’t bet him in a maiden race at this point, let alone in here. Toss. Notes: Perhaps no horse has overcome more this year to get to Louisville than the two-year-old champ. After a flop in his seasonal bow, he developed a foot abscess, a hind-end issue and his old behavioral problems crept up on him. Casse had to call a number of audibles along the way, all of which led to an Arkansas Derby win. Now, he has to repeat that performance in just three weeks. I hate the fact that all of his issues made him miss a prep – that’s one thing that really bugs me but there is no doubting his talent. My other issue is his mental make-up. Who knows what’s going to happen when $150K screaming fans proverbially smack him in the face when he comes out of the tunnel and heads to the gate. The only three-time G1 winner in the field may just have enough talent to win this but I feel it’s hard to take him as the favorite. An obvious win contender, I’ll use him in some multi-race wagers and all of my exotic plays. Notes: He hit the wire at Tampa on February 11 a perfect four for four and the likely Derby favorite. A strained ankle and third place Blue Grass finish later and he’s almost like the forgotten horse. His name hasn’t come off as many lips as you’d expect of late, especially with his rider opting to stay aboard. He’s won all three of his starts over the surface, a huge plus, but they were all last season. He missed some time and a prep, a big no-no but you look at his pedigree and it’s hard to completely dismiss him. I don’t think he can win but I do think he can get himself into the exotics. Notes: He ran two dynamite races at Tampa to start the season then flopped in a big way in the Blue Grass. He didn’t break well that day, something that must be rectified if he’s to have any chance in here and was up against the dynamic of race and surface biases. Thunder Gulch threw in a clunker in the Blue Grass then upset the Derby for D. Wayne Lukas, Pletcher’s mentor, back in 1995. Maybe Todd can take a page out of the coach’s book. He’s by Tapit but the bottom half of his pedigree doesn’t lend itself to the distance, so you’re in a bit of a conundrum there as well. I can’t blame you for tossing him but I have a feeling he’s going to rebound enough that he can grab a minor award. I will use him underneath in my exotic plays. Notes: No one, including Motion, knows exactly what happened when he got beat a pole in the Fountain of Youth and if they do they aren’t saying. I’ll speculate that he caught a track not kind to speed, found himself on the chase for the first time and had a bad day overall. I do know that he came back to sit an almost identical trip to run his best race to date. The rest of his form, save the FOY, is flawless. He has tactical speed, he’s not losing ground in the lane and his figures come back fast. He’s posted two Beyer figures of 101 this year. Only one other horse in here, J Boys Echo, has even seen a triple digit fig. He’s by Curlin, so the distance shouldn’t be a problem and he’s bred to adore a wet surface should the track come up off. Should be (0-15)sitting a few lengths off the early pace and have first crack at them. I think three horses have a chance to win this and he has the best one. The pick to win the 2017 Kentucky Derby!!! Notes: The stranglehold California runners have had on this race, winning the last three runnings and four of the last five, seems to have been released this year. All of the preps out there were S-L-O-W, save Mastery’s San Felipe win. This guy won the Sham and then the Santa Anita Derby last out and did so after getting himself involved in a couple of stretch duels. If the West Coast were to keep the Derby I think this guy is the most likely to help it do so. But it is really hard to endorse him as a serious win contender when you look at his final time and speed figures. Shirreffs taught him to race from off the pace last out but I don’t think it’ll help him get anything more than a minor award. I’ll use him underneath. Notes: Every single season there is a horse that gives me fits. Ladies and gentleman, version 2017. I know he is one of the more talented horses in this crop. To me, that’s certain. But it’s hard to ignore that he’s undefeated around one turn and winless around two. He couldn’t get by a maiden on the wrong lead in the Blue Grass. Let me repeat: A MAIDEN ON THE WRONG LEAD. It’s like they come off of the second turn and he goes one-paced. He grinds and grinds but never moves up. Granted, he hasn’t had the most pleasant of trips in his route races but at some point you have to stop making excuses. I’ve reached that point. I’m using him in my exotics simply because his talent may be enough to get him a slice. Notes: Apollo Curse time, as this guy didn’t race until mid-January. He has only one eye, which has made for a curious story on the Trail this season. Maiden win came against a decent field and his second in the Louisiana Derby was ok. Only two horses have won the Derby with four starts or less in the last 99 years. I don’t think he’s fast enough to win but he may be worth a look in the exotics. And, when you take his pedigree into account, may be one to keep in mind for five weeks from now in the Belmont Stakes. #5 Always Dreaming – Speedy & will run all day; comes true? #15 McCraken – Proven at CD, well handled & sharp as a tack. #17 Irish War Cry – Has run huge races; can spy the speed. #14 Classic Empire – 2yo champ back on track; good as any. #16 – Tapwrit – Going to excuse Blue Grass clunker; price! CLASSIC EMPIRE was just about written off after his poor performance in the Holy Bull and his refusal to train thereafter. He showed his ability to overcome adversity when he came back to win the Arkansas Derby despite the missed training and a rough trip. He figures to move forward off of that win and looks best for team Casse with Leparoux in the irons. LOOKIN AT LEE should be a big price breaking from the inside post but he looks like a live long shot. Corey Lanerie picks up the mount for Steve Asmussen and he will have him running at the end. STATE OF HONOR is also trained by Casse and looks like another longshot with a chance. He has the tactical speed to be in contention throughout and he has been training very well for the past two weeks. IRISH WAR CRY was very impressive winning the Wood. He showed the ability to rate and Graham Motion will have him ready for his best effort in Derby 143. 5 Always Dreaming, 8 Hence, 9 Irap, 17 Irish War Cry W/ 5 Always Dreaming, 8 Hence, 9 Irap, 10 Gunnevera, 14 Classic Empire, 15 McCraken, 17 Irish War Cry W/ 5 Always Dreaming, 8 Hence, 9 Irap, 10 Gunnevera, 14 Classic Empire, 15 McCraken, 17 Irish War Cry. Clunker in this race and I am a bit peeved. I came up with 1-8-5 and all day said to myself toss out the Fair Ground horses. Of course Local Hero was a Fair Ground Horse and #8 won the race paying $19.80. +4 overall for the day. May miss the next race, not 100% sure but will have KY Derby Selections for certain. Awaiting to see how the track is and if rain hits. I just looked at their odds and they are way off to what the track lines are. Keep in mind they are fixed odds. Paid $4.40 to place. Was a little further back than I liked and that was the difference of winning and coming in second in this race. The rain is something that is going to keep the track muddy/sloppy. This helps my handicapping of the race as I had two horses vying for my #1 spot. The rain has made it easier and the last race Awesome Slew had with his trip solidifies it. To save time I wrote this in 2013 and I can't write it any better than I did then. I didn't see a commercial today for the West Virginia Derby but when they did the special on NBCSN with Tom Hammond in the yellow car and reliving his favorite KY Derby moments and how he got involved, it did bring a tear to my eye and I thought about my grandfather and all the memories from years gone by. RIP Grandpa and Sunday Silence. My top choice is #17 Irish War Cry. When I did my handicapping last night. I wrote WET next to his name and when it started to rain in the 10th race, that cemented for me this was the right selection. When I saw the run Awesome Slew did from the back of the pack, that put things over the top that Irish War Cry would be my pick. He will run pretty much the same race unless there is a change in tactics. The only difference is, he is going to win !!! My second choice is Gunnevera and was pretty equal to my top choice and I couldn't split hairs until it rained and the 10th race finish. I will likely bet him to win as well for insurance purposes. Third choice is Patch. I don't like the fact he got bet down from 30-1 ML because the value is pretty much gone. This race is much more wide open than in recent years and any of the horses I have listed can win and it wouldn't surprise me if they did. Good luck on the derby and remember it's one race, their will be another race ran 15-20 minutes somewhere else after the Derby. The biggest mistake people make is going nuts on one race and getting crushed. Don't be that guy or gal. Well that didn't work out to well. The only thing that came through is Battle of Midway to help fill out the Superfecta. I didn't like the ride that Irish War Cry received, 4 wide the whole race and came up empty down the stretch. You had a bit of excitement and hope coming around the turn but a second or two later it was over. Always Dreaming may be a special horse. I looked at his run line and thought he would bounce big time after that Florida Derby he ran. If you look at his line you'll see what I am mean. It's going to be interested to see who moves forward to take on Always Dreaming in the Preakness. If he gets another set up as he did today it will be hard to beat him. But I am going to be looking at the bounce again. We shall see. I hope you enjoyed the information and picks put forth in this years edition of the Kentucky Derby.